In addition to lighter weight, corrosion resistance, higher strength and lower life cycle costs, FRP technology offers faster installation. Prefabricated FRP panels can be installed quickly, compared to the labour intensive process of erecting formwork, placing rebar, pouring and curing concrete, and removing the formwork needed to construct a cast-in-place bridge. Eliminating the need for heavy equipment, FRP panels are generally placed starting at one abutment with light equipment such as an excavator. 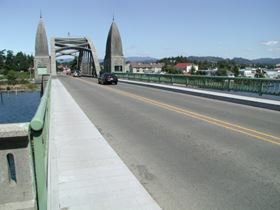 A bascule bridge example is the Lewis and Clark River bridge in Oregon. 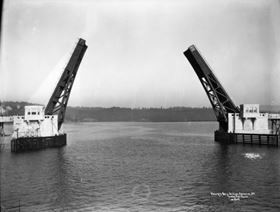 It is a single-leaf bascule-type drawbridge built in 1924. It was rehabilitated in 2002 with a new FRP deck, operating machinery, machinery house restoration, bridge rail retrofit, and repairs to the approach (see below). 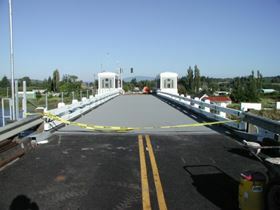 FRP deck and polymer concrete wear surface installed on Lewis and Clark River Bridge. In the case of replacing steel grating (shown here), FRP (shown below) provides a lightweight, solid surface deck that helps reduce corrosion to the superstructure and reduces noise levels for neighbouring businesses and parks. Steel grate bridge with FRP deck. With a 14-year track record of bridge installations under its belt, the fibre reinforced polymer (FRP) composites market continues to offer significant benefits to the transportation infrastructure in the USA and around the world. Although early predictors indicated high volume demand for FRP, quantities have remained somewhat low due to several contributing factors. However, over the last decade specific bridge configurations have emerged that are especially suited to FRP bridge technology. Composite technology made its first appearance on a US bridge project in 1996 in response to the need for corrosion resistance and long life. The performance advantages of composites translated into faster installation times, improved load-carrying capability and literally no maintenance. Since then, nearly 100 US bridges have been rehabilitated with composites (with a total of more than 200 bridges worldwide). These installations have helped demonstrate the technology’s capabilities and introduced a valuable material option to bridge designers and owners. Many early installations were demonstration projects where research and development funding was available to introduce FRP to the bridge industry. Now, with much of the demonstration stage completed, FRP decking is judged on a competitive basis against traditional material options. And while the usage of FRP decking has grown, bridge owners have been challenged by cost premiums and bridge designers have been slower to accept the material. The following evaluations, case studies and competitions help bring into focus where FRP materials can provide the best fit and the highest value to owners. For designers and bridge owners FRP decking offers a number of advantages that can provide dynamic solutions as well as long term benefits. 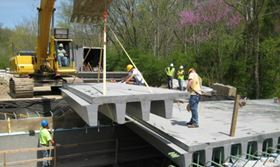 FRP bridge decks weigh only 10-20% of a structurally equivalent reinforced concrete deck. Using an FRP deck to replace a concrete deck reduces dead load significantly. This means load-rated structures may be re-rated to their original design capacity or ageing structures may be kept in service longer before being replaced. In new construction, lighter dead load can translate into savings throughout the structure, as the size of structural members and foundations can be reduced accordingly. Since FRP deck panels usually weigh less than 6000 lb each, simpler equipment can be used to install the deck. Backhoes or excavators that are already at the site are sufficient. Expensive cranes are not required which reduces installation costs in all cases and occasionally is a major functional benefit when overhead power lines limit crane usage. Corrosion of reinforcing steel is the leading cause of premature deterioration of concrete bridge decks. Use of road de-icing salts, combined with higher-than-anticipated traffic loads, accelerates this corrosion. Because FRP materials are not susceptible to corrosion, FRP bridge decks offer a great alternative to conventional materials for this major maintenance issue. This benefit is most important in cold climates with snow or coastal areas with salt water. FRP materials have demonstrated excellent durability in corrosive chemical environments for 50 years without degradation. This provides a strong basis for the expected 75-100 year life for FRP decks. Fabricating deck panels in a factory and shipping them to the bridge site offers several advantages over cast-in-place concrete: quality can be closely monitored in a controlled environment; the potential for weather delays is greatly reduced; and most significantly, bridge down-time can be substantially reduced. Once the superstructure is prepared, prefabricated FRP deck panels can be installed quickly, compared to the labour intensive process of erecting formwork, placing rebar, pouring and curing concrete, and removing the formwork needed to construct a cast-in-place deck. Composite decking provides high strength with very high safety factors. Since FRP material is not as stiff as steel and rebar, the stiffness performance requirements drive the design of FRP decks. Deflection criteria have become the most important performance check. Deflection criterion for FRP decking is often more conservative than concrete deck criteria – partially because FRP is still considered a somewhat new material and because end users want to minimise reflective cracking in the wear surface. But static tests of FRP decks clearly demonstrate that the decks greatly exceed specified performance requirements and provide high safety factors. Corrosion resistance results in very low maintenance of FRP decking which translates to lower future maintenance costs. It also means that FRP decks will last longer than traditional materials. These add up to lower life cycle costs for FRP. The primary benefit of FRP for general bridge structures is corrosion resistance which delivers long life and very low maintenance. Most of the value of FRP for bridges is in the future. As with most things, great benefits typically come with a higher price tag. The economic difficulty for most bridge owners is paying a premium cost upfront to enjoy future benefits. Government entities make selections on low bid for the acquisition cost and don’t include space to address future cost savings. Given the high demands of an ageing infrastructure with limited funding, government entities also have a difficult time paying for future benefits. The ability of government bridge owners to account for the true and total life cycle costs of their structures is critical to helping newer technologies like FRP bring their benefits and full value to the market. Because of the projected durability of FRP bridge decks, savings in deck replacement and maintenance costs over a 100-year bridge service life cycle could be much greater than the initial cost of the entire structure. The life cycle cost savings can be shown to more than offset the relatively high initial cost of FRP materials when compared to conventional material. However, long-range durability claims are viewed by the construction industry with some skepticism. Furthermore, few public agencies select materials based on projected life cycle costs. Instead, materials are chosen based on the engineer’s experience and judgment, agency preferences, and industry standard practice, usually with a strong bias toward minimising initial construction cost. When FRP was first introduced into the bridge market, the strong benefits held promise for FRP to capture a reasonable share of the market. The cornerstone supporting this projection was that there are more than 580 000 bridges in the USA alone and about 197 000 of those have been rated as deficient. These large numbers led to the composites industry over-estimating the amount of market penetration. After 14 years, it is evident that FRP is still not the material of choice for bridge rehabilitation. There are a number of reasons for this, but the main reason is the price premium for FRP when compared with traditional materials. Other factors include real market size, competition and budgets. Many bridges counted as deficient are still structurally adequate and can be operated for decades. The need to rehabilitate older bridges in rural areas with low traffic count is also decades away. At the same time, baseline competition has continued to move forward. Concrete has enhanced its value through property improvements, more options like low density, and pre-cast alternatives. Concrete is simple, known and inexpensive. Budgets are shrinking which leaves owners with having to fix more with less. This pushes owners to select the lowest cost (and often lowest lasting) alternative. Unfortunately, personnel that may inherit the bridge will have to deal with the consequences associated with that initial choice. Life cycle cost studies have shown that 75-85% of the costs are not considered in the purchase decision. Maintenance costs are also not given much consideration unless they are exceptionally high and immediate. Volume, regardless of the product, is another major parameter in selecting the best manufacturing process. For FRP decking options, there are two primary manufacturing processes. One is a batch process in which deck panels are made from start to finish as individual parts. This process infuses resin throughout the fibreglass layup resulting in an integrally moulded deck panel. Pultrusion, the second mainstream option, is a continuous manufacturing process which produces constant cross section parts. The pultrusion process can produce a high volume of shapes which can be finished into deck panels. This process offers a cost effective approach for high volume demand. When the potential for high volume was first anticipated with FRP technology, pultrusion was seen as the best process for lowing cost premiums. With the constraints that have surfaced in bridge design and construction, these volumes have not been attained. One key constraint is that every bridge has a unique configuration and varying requirements. Replication is rare. As a result, costs for both resin infusion and pultrusion are similar. While raw material costs drive the deck cost and a similar amount of material is needed in any process to meet performance requirements, resin infusion offers the flexibility to provide benefits that constant section bridge products can’t deliver. This includes moulded-in camber, sloped decks and pre-fabricated features such as curbs and drain scuppers. This versatility makes resin infusion of integrally moulded FRP decks especially suited to delivering an effective combination of price and features for the current market. In today’s infrastructure market, four bridge applications continue to make strong use of FRP composites despite the cost premium. Each application has a critical requirement for light weight to meet the design and operational objectives. In these cases, owners still receive the benefits of corrosion resistance and a longer life cycle while gaining the value of a light weight deck. pedestrian deck additions to vehicle bridges. Movable bridges are found mostly in coastal and port areas. Large port cities on the coasts, rivers and Great Lakes have bridges that must accommodate heavy truck traffic to ports as well as have the capability to accommodate the passage of commercial ships. Coastal cities with rivers and intercoastal waterways have bridges handling local traffic as well as commercial ships and pleasure craft. These bridge types include lift, swing and bascule bridges. Traditionally, the decks for these bridges are steel grate or steel/concrete. Deck weight has a direct effect on the cost of the mechanical equipment and the operational costs. FRP decking is the lowest weight option. It provides a solid decking surface to protect the superstructure and is preferable to steel grating. FRP decking has been used on a number of movable bridges. In a few cases, these bridges are in port areas and carry a significant percentage of heavy truck traffic. Since weight is a driving factor, a polymer concrete wear surface is typically used rather than thicker and heavier asphalt. Light weight decking is also valuable in the case of the historic steel truss bridge. Many steel truss bridges were constructed in the first half of the 1900s and carry historic value for their community. Many of these bridges are load rated since they were not designed for current vehicles. FRP is a great option for reducing dead load. This reduction can be as much as 80 lb/ft2. Rather than replacing the historic bridge, FRP decking enables the community to keep the bridge and still handle higher loaded vehicles. A recent design study for a California bridge compared the current concrete deck with an exothermic steel/concrete deck and an FRP deck. The concrete deck came in at 105 lb/ft2, the exothermic deck at 55 lb/ft2 and the FRP deck at just 16 lb/ft2. One example is Schaeffer Road bridge in Ashtabula County, Ohio. This steel truss bridge was built in 1936. It is a three-span continuous steel beam bridge with overall dimensions of 175 ft long and 17 ft wide. The local community did not want a replacement bridge because it valued the steel truss structure. The FRP deck at 18 lb/ft2 saved enough weight to remove the load rating on the bridge. 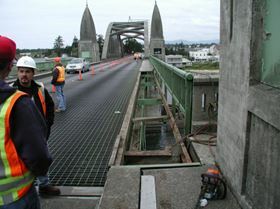 FRP decking provides an effective replacement option for cases involving bridges with steel grating. While steel grating offers a light weight of 17-28 lb/ft2, exposure to water and chemicals quickly takes its toll on the grating and exposed superstructure underneath. The serrated grating surface becomes worn over time and vehicles lose traction during rain, snow or ice. In many cases, the superstructure was designed for the weight of the steel grate deck. Bridge owners must either opt for a new steel grate or an FRP deck. Since filling the steel grate with concrete can add up to 55 lb/ft2 to the weight, this option is not viable. FRP offers a weight of just 16-20 lb/ft2 making this option preferable. A second benefit of the FRP deck is that businesses, hotels, restaurants and parks located near the structure enjoy a reduction in noise with the quieter FRP deck. A lightweight, solid surface deck is the right answer to reduce corrosion of the superstructure. The fourth case application is attaching pedestrian/bicycle bridges to existing vehicle bridges. With more communities requesting bicycle paths and pedestrian connectivity, an attractive alternative to building completely new bridges is to cantilever the pedestrian bridge off the vehicle bridge structure. Minimising dead load is essential to the success of such a project. If structurally feasible, adding to the vehicle bridge is more cost effective than constructing a new pedestrian bridge parallel to the vehicle bridge. FRP decking has been used in this way for the Tower Bridge in Sacramento, California. The Tower Bridge is a historic lift bridge with existing walkways on both sides of the bridge. The walkways were only 3 ft wide and could not adequately accommodate pedestrian and bicycle traffic. The long term growth of both riverfronts depended on safe and easy access. Weight limitations on the center span could not accommodate the desired 10 ft wide concrete sidewalk. Over time, FRP will continue to mature as a beneficial option for designers and owners. It takes time for any new material to develop the procedures, specifications, design knowledge and owner comfort level to be a standard alternative. The value that FRP brings with its corrosion resistance and light weight will increase its usage over the next 14 years. But it is in the specific bridge applications where light weight is critical that FRP brings value to owners and designers now. The realities of the current market shows that the best applications for FRP are movable bridges, steel truss bridges and pedestrian bridges that cantilever from existing vehicle bridges. The Federal Highway Administration (FHWA), a division of the United States Department of Transportation, offers statistics on bridges by structure type. Currently there are 883 movable bridges and 12 608 truss bridges in the USA. While this is only a small percentage of the total number of US bridges, FRP will be a ‘good fit’ for many of these bridges and will provide an optimum solution for their owners while demonstrating the strong benefits of FRP to the entire bridge community. Scott Reeve is President of Composite Advantage LLC (CA), a manufacturer of FRP decks and FRP superstructures. This feature was published in the January/February 2010 issue of Reinforced Plastics magazine.